There are two different kinds of deadlines and you likely treat them each differently. External deadlines are those promised to others. They provide automatic accountability. You assume these deadlines are set in stone and can’t be changed so you’re less likely to break them. Internal Deadlines are those you set for yourself. 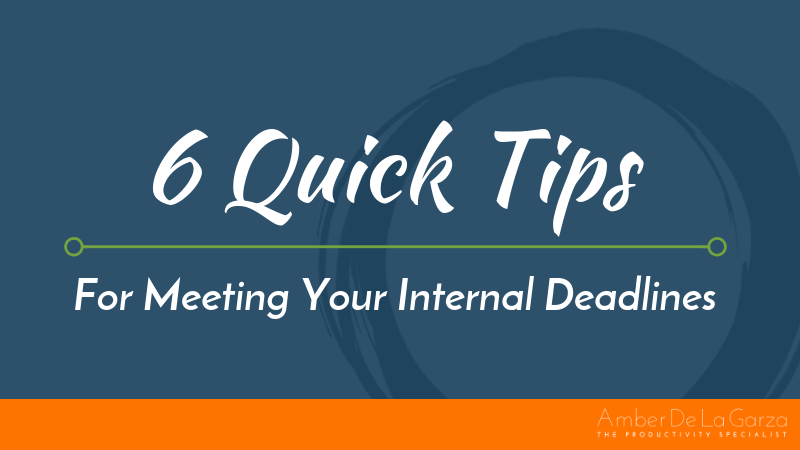 You tend to put internal deadlines off, sometimes until it’s too late to take action. You negotiate the possible outcomes, the quality, the quantity, or the due date. And when you do so, you’re negotiating yourself out of success. You would never call Marriott and say, “Yeah, about that training… can we change it to next month? Because, well, life happened and I just don’t have time to work on it this week.” The deadline is the deadline. If you don’t arrive prepared and deliver a training on the date written in the contract, you don’t get paid and risk your reputation. You would NEVER do that and yet those are the exact types of conversations you have with yourself. You negotiate with yourself on the deadlines you create for your own business ALL THE TIME. And those deadlines are most often based on outcomes or milestones your business needs to hit to reach the next level of success. And you know what? You’re not just putting milestones off by days or weeks, you’re often putting them off by quarters or longer. Continuously doing so will keep you on a plateau of little to no growth. You can rationalize with yourself all you want with the “maybe next month or “maybe next quarter” but I can tell you from experience that doing so has huge implications for your business. You must hold your deadlines to yourself just as sacred as you would to others. I recently announced on my podcast that I have a beta program coming up and I’d be launching it October 1st. Announcing that deadline to my thousands of listeners created immediate accountability and you better believe I had it done and ready in time. It’s creating those kinds of big deadlines and sticking to the challenge of completing them that will give you the biggest jumps on growth in your business. I pitched a brand new topic I hadn’t written yet to a client for a keynote, complete with title and speaking points. Once I sent off that email and even more so when I signed that contract, I absolutely had to write it. There was no turning back. I had committed to deliver a brand new keynote on a certain date. When I started podcasting, I decided I would put out a new episode every Monday. I created those Monday deadlines for myself. It’s up to me to consistently do the prep work and record the episode in time. But, alas, I am only human and I have moments of weakness so I created external accountability by making my podcast listeners and newsletter subscribers aware of my Monday drops. I told them people on-air, in content, and on images that a new episode of Productivity Straight Talk would go live every Monday. Now, they rely on me to deliver that new content to their inboxes each week and I feel obligated to make that happen. I see this a lot with losing weight. People will post a “before” picture of themselves on social media and announce their goal of losing a particular number of pounds in so many weeks. You may not even know most of your “friends” or “followers” and yet, you feel socially accountable to them to lose the weight, write the book, launch the program, or complete you-name-it by your posted deadline. Your posse is made up of the friends and family who will support you through both failures and successes in your business and personal life. They’re the people you can 100% confide in because they’re going nowhere. Tell them your deadlines so they can support you by holding you accountable to follow through. On Labor Day weekend one of my girlfriends claimed she had extremely low energy and had been that way for a while. As someone who cares deeply about her, I made her commit to getting bloodwork done the following day. I went the extra step of telling her I’d text her the following day to confirm she booked the appointment. The following day I texted my girlfriend and sure enough, she booked a bloodwork appointment. Something she had said she would do for years finally happened because she was finally being held accountable. Nothing else had changed. Don’t just tell your team about your deadlines. Empower them to hold you accountable to them. Put your important deadlines on your team members’ calendars too and request that they periodically ask you about your progress within reason. Your assistant saying, “Hey, do you still plan on creating that worksheet by this Friday?” brings that task to mind and goes a long way toward holding you accountable because it makes you feel like you’re being counted on to produce what you said you would. Entrepreneurs don’t purposefully miss or put off deadlines because they aim to screw their success trajectory. Instead, you casually put off deadlines because you feel you’re justified in doing so. “My kids have a lot going on this month” or “I’ve been sick” or “I’ve been traveling” seem like sound justifications to put off deadlines but they’re really just excuses. And trust me, you will ALWAYS have plenty of excuses not to make your internal deadlines. That’s why it’s necessary to create external accountability that prevents you from pushing deadlines back. Thankfully, you don’t risk capital punishment when you miss your internal deadlines but you’re still risking a lot. When you continually miss your deadlines, you’re pushing back the tasks and projects that matter. You’re pushing back the milestones you had aimed to hit to achieve your goals. You’re pushing back the timeline you had established to grow your business and quite frankly, you’re risking your success because the act of pushing back deadlines becomes frequent and even routine, leaving you with goals that are always outside your reach. Make it a point to create external accountability for your internal deadlines to give them the best shot at succeeding.